Ever since the success of Korean American chef Roy Choi’s ‘Kogi BBQ taco truck’, Korean and Mexican fusion has been huge. It really is a genius combination of flavors that totally make sense. Both cuisines are saucy, hearty and down to earth. And they are very hot and spicy relying heavily on chilis. Somehow when all those strong flavors get mixed together magic happens and everything becomes even more fiery and tasty. Although I have to say, putting cheese on food in Korea started way before ‘Kogi truck’. Cheese in instant noodle soup, BBQ chicken, rice cake, omelette, Kimbap (Korean sushi roll) and Kimchi fried rice…you name it, we’ve had it as long as I remember. What can I say we are just obsessed with stinky fermented food :-). 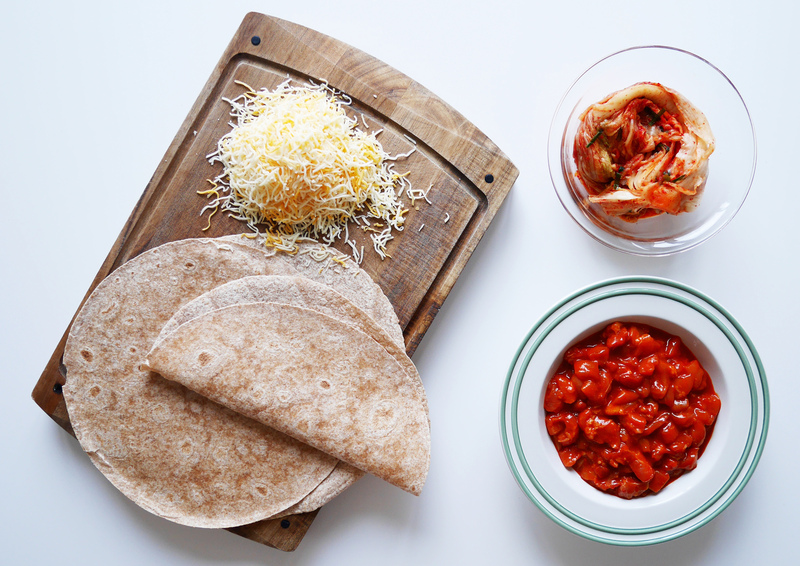 Anyways, today I will be sharing a Korean Mexican fusion recipe with my favorite combination of spicy food and cheese. And lemony avocado mash will add freshness to the dish as well as helping you cool down. I knew this recipe would work well when I planed it in my head. But it turned out to be one of the most delicious things I have ever made ;-). 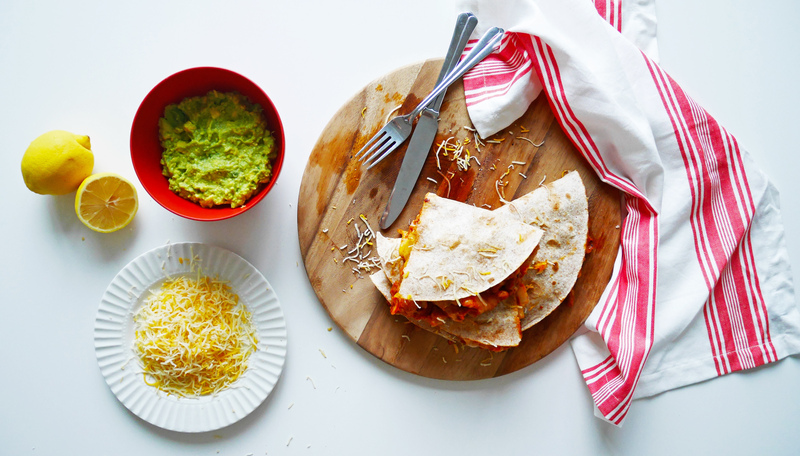 I encourage you to be adventurous and try this dish! Chop chicken thighs into 1-1.5cm squares. Marinate in gochujang, mirin, honey and sesame oil for at least 2 hours. Meanwhile mash avocado, add fresh lemon juice and zest. Cool it in the fridge. Roughly chop kimchi into 3-4cm squares and set aside. You can also get ones that are already chopped from the supermarket. We normally use old Kimchi for stir-fry dish like this. Old one definitely has more intensity and depth of flavor. If you have old Kimchi in the fridge, this is perfect time to use it. Coat a medium high heat pan with 1 tablespoon of light olive oil. Add marinated chicken and crushed red pepper. Cook for 3-4 minutes or until chicken starts turning opaque and springy. Add in chopped Kimchi and stir-fry for another 4-5 minutes. Juice from the meat and Kimchi should have been absorbed. When the chicken and Kimchi are cooked, turn off the heat. 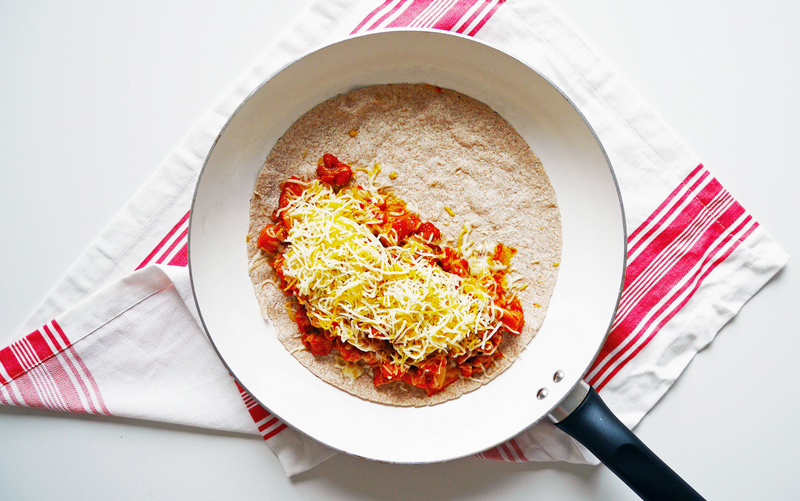 Prepare another non-stick frying pan in a medium heat and place a tortilla. 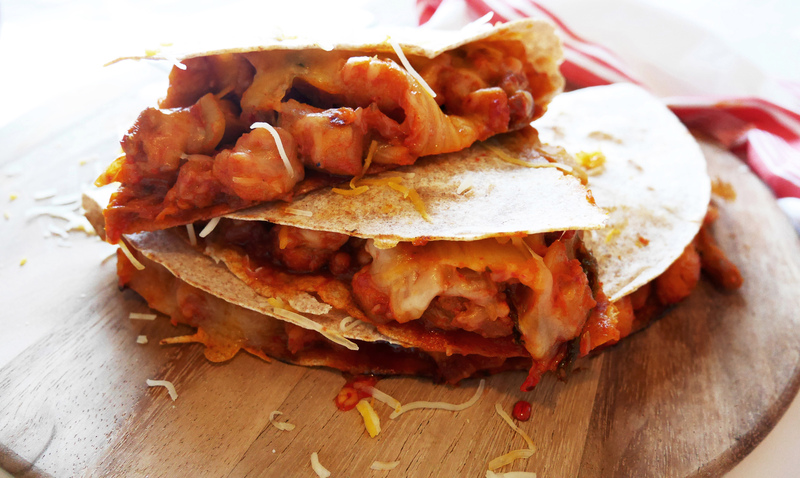 Add chicken, Kimchi and shredded cheese on half of tortilla. When the cheese starts melting fold over the other half to cover and gently press. After 2-3 minutes take it off the heat. 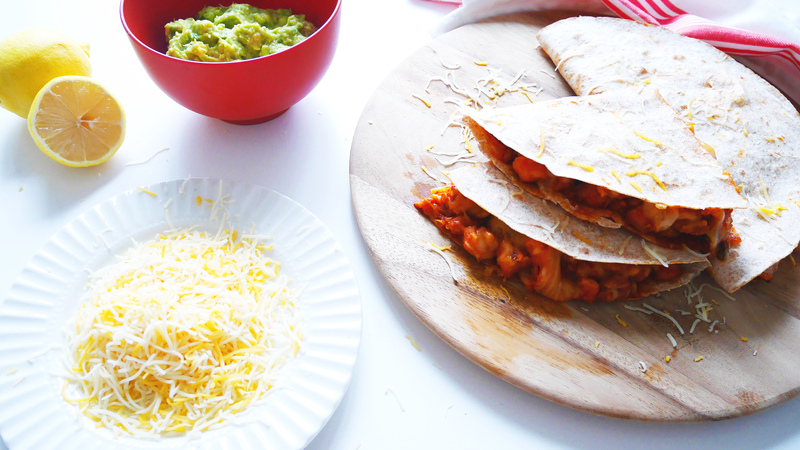 Repeat the same process with 1 more tortilla and plate the quesadillas with avocado mash. I’d never heard of Mexican-Korean fusion cooking before, but I love kimchi and I love Mexican food so I guess I’ll have to try this now!